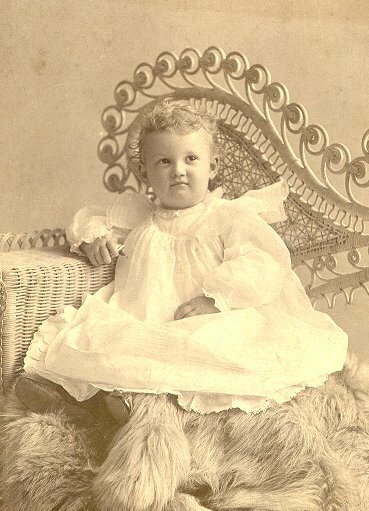 JULIA RICHARDSON IRVINE, 2nd child of Louis Clarke Irvine and Julia Richardson Upham, was born in New York City on 12th June, 1895. As attested by her picture Julie was a beautiful child, her trusting brown eyes and ever ready smile haloed by a mass of wavy brown hair. 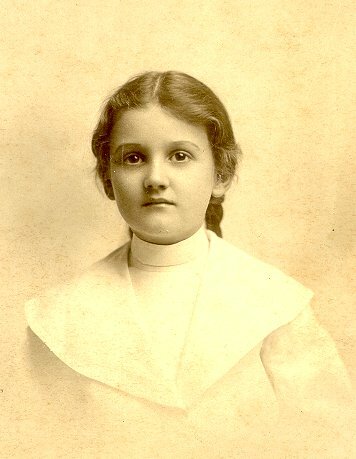 Julia was a normally healthy child thru the various family moves - a stop-gap visit with her Grandparents in Mobile while her father sought a more healthful climate for himself in San Antonio, and after a couple of years a shift to St. Louis - in time to be among the kids to enjoy the sites of the Louisiana Exposition, her parents living almost next door in the Annex to the Montecello Hotel on Park Ave., which bordered the Park on the east. 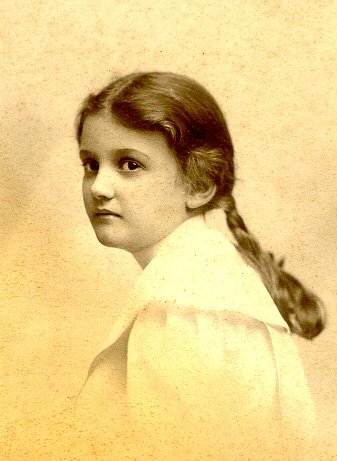 School was started at the Eugene Field School, where her geniality and spirit made her a favorite among her playmates. Early in her 9th year an accidental injury occurred - her great toe was badly lacerated by being caught under a heavy swinging door, became infected, a blood stream contamination ensued (septicemia), secondary sites involved being the right mastoid and the mitral valve of the heart. Operation on the mastoid proved ineffectual and the valvular involvement smoldered for months - sapping her vitality and making for an incurable condition. 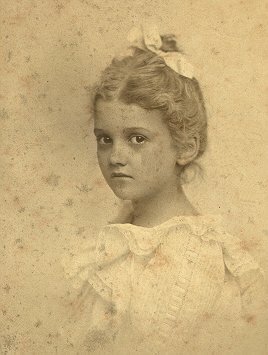 In hopes a milder climate might expedite recovery she was taken with her brothers to Mobile, temporary quarters being established at her Grandmother Uphams home at 1906 Dauphin Way. The move was of no avail - the valvular involvement so embarrassed circulatory efficiency the overburdened heart progressively failed and massive terminal swellings preceded the final exhaustion of her little heart - the end coming the 5th of June, 1905, just 7 days short of her 10th birthday. Interment was in Magnolia Cemetery, Mobile, in a corner of the Upham Lot which held the earthy remains of her maternal Grandfather and her mothers younger sister, Georgiana.